So you are ready to open your coconut are you? Let the fun begin! I have tried quite a few different ways to open both young and mature coconuts and lets just say I am probably lucky to still have all ten of my fingers. After doing quite a bit of research, I found a couple of safer ways to open a coconut. Interestingly enough, the type of coconut you have, young or mature, will determine how you will open it. Located somewhere on your mature coconut are three eyes, if you can’t find them right away you probably need to clean the hairy husk off the nut until you find them. These little guys will be your first point of entry into the coconut. You will need to grab a sharp knife and locate the soft eye. Two of the eyes are symmetric and one of the eyes isn’t, that funny eye is the soft eye. Take your knife and dig the eye out. 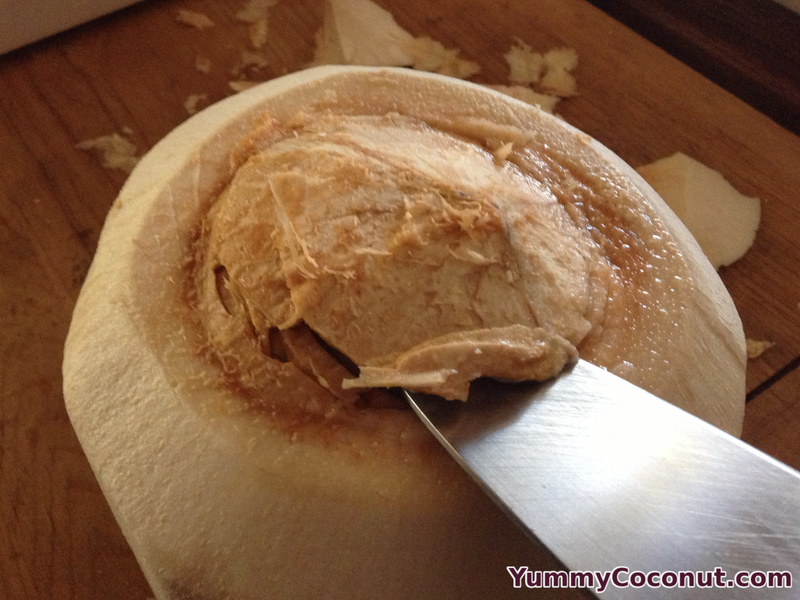 You may be lucky enough to pierce through the flesh all the way into the coconut at this point, however if you aren’t then you will need to use something to scrap the meat out until you reach the coconut water. A file, a drill bit, anything that is slender enough to fit where the eye used to be and stiff enough to scrape the meat out. Then proceed to drain the coconut water. Once the water is removed, you can move on to opening the rest of the nut. One method of opening the nut is to use the back of a cleaver to crack a line all the way around the nut, splitting it in half. Hold your coconut in one hand, your cleaver in the other, whack the back of your cleaver in a line going around the center of the nut. This will cause it to crack all around the nut and split it in half. Another method is to place your coconut in a bag, grab a mallet/hammer and give the nut a good whack to crack it open. This method is a little messier but it gets the job done. Finally, if you have no meat cleaver, and no mallet type of object, you can take your drained coconut outside and toss it down onto the cement or other hard surface. 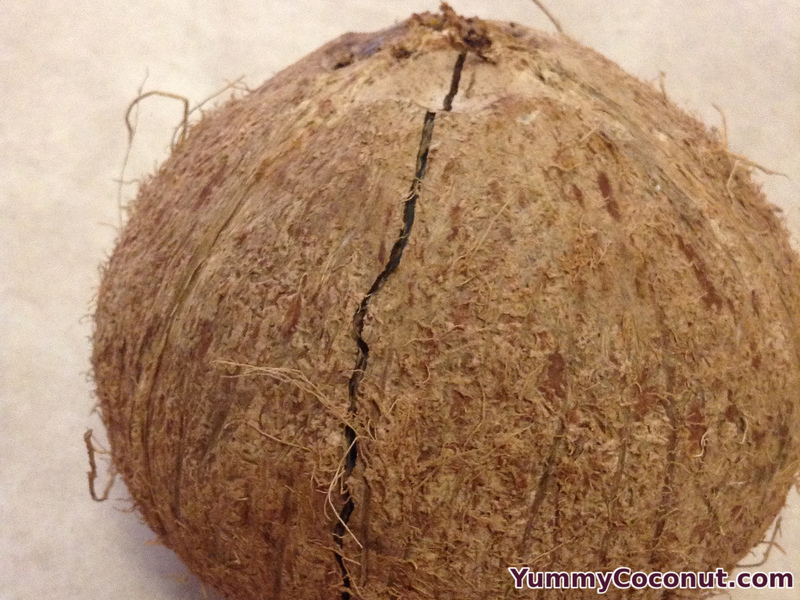 Your coconut will be opened and you won’t have to worry about coconut shrapnel inside your home. 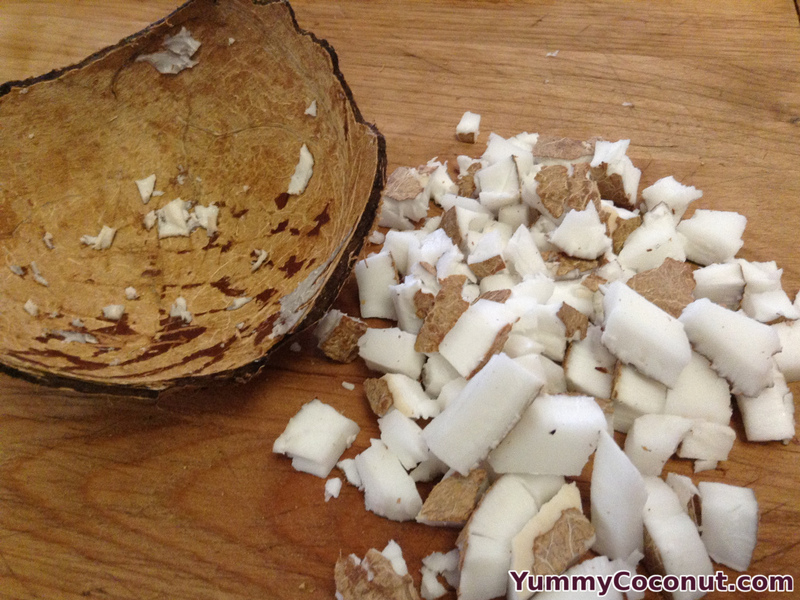 Once you have your coconut opened, you will want to remove the meat. You can do this by taking a paring knife and scraping the meat off of the hard outer shell. If you have brown skin left on the back of the nut you can either leave it on and eat it or remove it by cutting if off with a sharp knife. Coconut meat that magically fell out of the coconut. The best way that I have found to open a young coconut and spill the least amount of coconut water involves just two things, your coconut and a sharp knife. First you want to use your knife to cut off the outer husk at the top of the nut. Cut off enough of the husk to expose a 2-3 inch diameter circle of the top of the nut. Leave the rest of the husk in tact, it will act as a base to keep your coconut from tipping over. 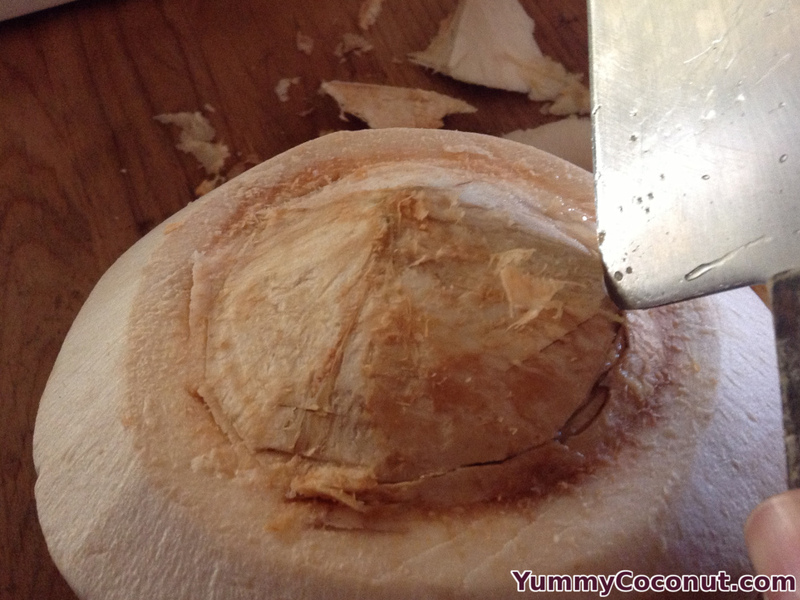 Now, take the part of your knife closest to the handle and use this point to smack all around the top of the coconut on the outer edges of the exposed nut. You will create a crack in the rough shape of a circle all around the exposed part of the nut. Once your circle is complete, take the tip of the knife and slid it into the coconut to cut the thing layer of flesh holding the top in place. 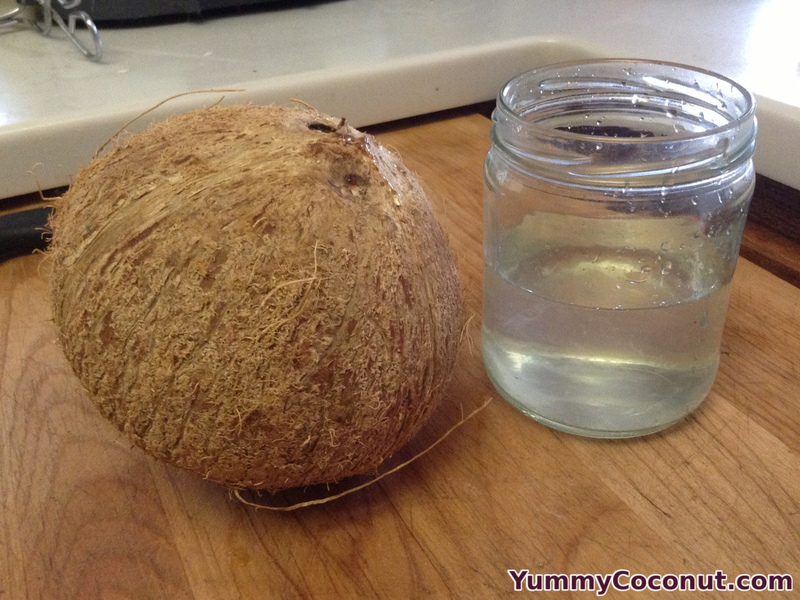 Remove the top piece, toss a straw in the coconut and drink away. Or you can pour it off into a cup for other uses. 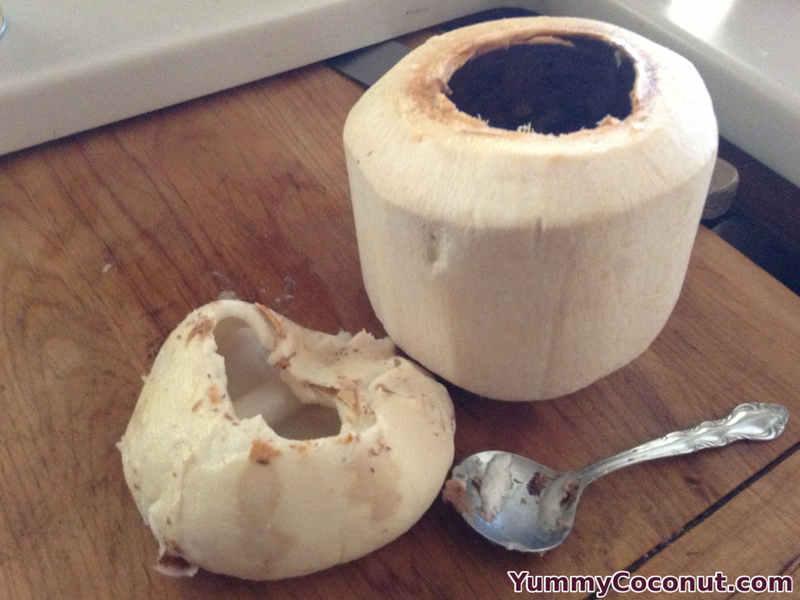 Once your coconut water has been consumed, you can proceed to remove the coconut meat. The meat of the young coconut is easily pried out using a spoon (or hand, if you can fit yours in) to pry the flesh off the husk. That’s it, enjoy your coconuts! About young coconuts: easier and more enjoyable way in my view is to start using the “weak eye” of the coconut, as we do for mature one. 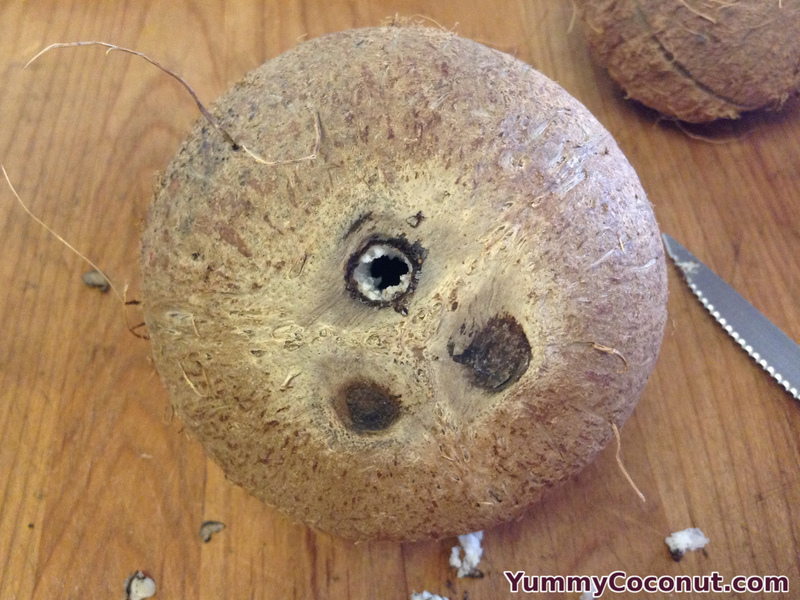 Eyes are located on the flat side of “diamond shape” coconuts. Put the coconut on its rolling side. Cut a app. 2cm (1 inch?) layer off that flat bottom surface, like you would cut a slice of bread or sausage or whatever. You will reach the coconut shell, or almost. 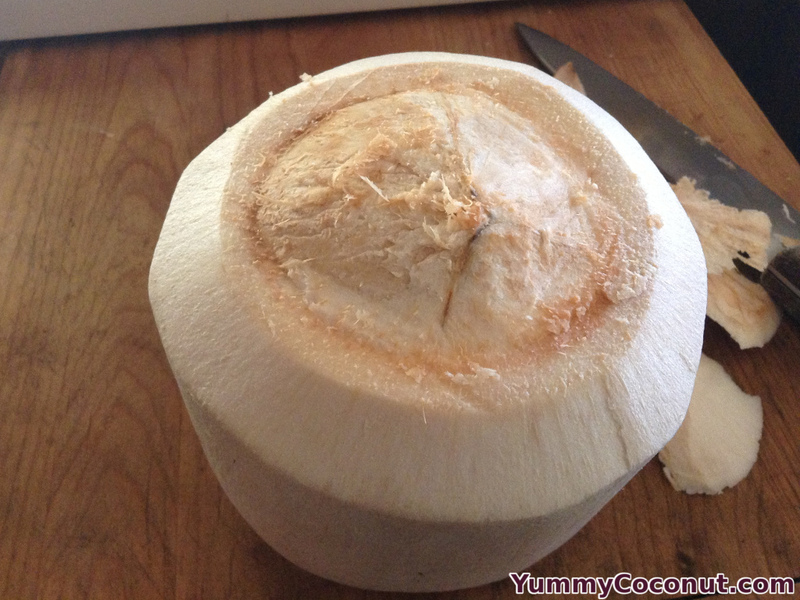 It is whitish and not as hard as the one of a mature coconut. Scratching the husk a bit more, you will find the three eyes. One is the weak one ; test them with a knife tip. Most of the time actually the first eye that appears is the weak one. It is super soft and super easy to open with a knife tip. Then when the coconut is really young-young-young you can further open it simply with a knife as is almost does not have a shell at all yet (but also has no inner flesh either actually). If it does have a “wooden” shell, then a meat cleaver is the best is my experience, or a saw if you want to open the nut in a “clean” way if you have a plan to use the shell later on.